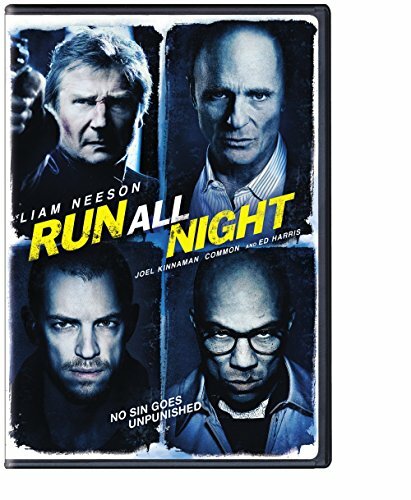 Buy Run All Night cheaply from Amazon. You too can earn money from writing articles by signing up for InfoBarrel. Run All Night opens with Liam Neeson's character, Jimmy Conlon, lying on the ground, badly injured - possibly shot - from the looks of it, with a rifle of some type lying next to him. Then it goes back 16 hours. Jimmy is sitting in an Irish pub in New York city, apparently passed out from drink. He is, by all appearances, an alcoholic who is having difficulty sleeping at night. Jimmy sees the son of the pub's owner, Danny (Boyd Holbrook), and asks him for some money. Danny doesn't think much of Jimmy, and can't see why his father is keeping him around. Danny's father, Shawn (Ed Harris, Gravity, Man on a Ledge), and Jimmy are childhood friends and are close, despite Jimmy's current state. Credit: https://en.wikipedia.org/wiki/Run_All_Night_%28film%29#/media/File:RunAllNight_TeaserPoster.jpgJimmy's son, Michael (Joel Kinnaman), is a limo driver, happily married with two young girls and a third child on the way, and teaches at a local boxing gym. He is estranged from his father, and hasn't seen him in five years. Unfortunately for him, his fare that night is the two Albanians, who he takes to Danny's place. There, he sees something that he shouldn't have, and Danny tries to kill him. As a result of this, Jimmy ends up shooting Danny dead. When Jimmy tells Shawn this, the latter tells him that he is going to kill Michael, his family, and finally Jimmy. Despite the fact that all Jimmy was doing was protecting his son, and Shawn had told Danny to keep out of it, Shawn is rather hypocritical in his response, although it's probably a common fault. Shawn sets all his people to hunting down Michael and Jimmy. It's not that easy, though. The reason Jimmy drinks so much and has trouble sleeping is that he was, for years, Shawn's enforcer, and has killed a lot of people in the past. He's perfectly willing to kill a lot more to protect his son, even if his son hates him, as Michael knows what he used to do, and the two best friends go to war in a long, brutal night. There are crooked cops, honest cops, hitmen, car chases and lots of gangsters on the loose, and quite a lot of violence. The only cop that Jimmy really trusts is Detective Harding (Vincent D'Onofrio, Escape Plan, Jurassic World) - and that's only because Harding has been trying to put him behind bars for the last couple of decades, so he knows that he's not on the take. Harding is also not the best ally, as what he wants is different to what Jimmy wants - he wants Jimmy locked up, and thinks that Michael is just like his father. Jimmy Conlon is another one of Neeson's flawed heroes - in this case, so flawed that he's more of an anti-hero than a hero. He drinks too much and has murdered a lot of people in the past. Conlon is definitely not a good guy, but he will do whatever it takes to protect his son, and not just from physical threats. Jimmy wants his son to not go down the same path he did, and tries to ensure that he doesn't have to kill anyone, even in self defence. In terms of style and feel, this film has more in common with A Walk Among the Tombstones than the Taken franchise. Jimmy Conlon is still competent, albeit flawed, but not as unstoppable as the character of Bryan Mills. The film work is at times a bit odd - there are a number of swooping scenes as the camera dives around New York, or slowed down ones as well. The latter are not the action scenes, either, but are instead fillers. On the whole, these are a bit disconcerting and seem rather needless. Harding, as a character, seems a bit underutilised. Run All Night takes some time to get going, and it isn't purely an action film, but more of an action thriller. The action scenes can be quite brutal, but there are a lot of other scenes between them, as the characters converse with each other. Even after basically declaring war on each other, Jimmy and Shawn still sit down and have a chat. To a large extent, the film is about relationships. How a decades long friendship can end after one act; how for both men their sons are the most important things in their lives, even over their best friends, and even despite Shawn being unhappy as to how Danny turned out and Michael and Jimmy not having a relationship at all. Between the action, Jimmy and Michael do talk about things, although Michael is rather confrontational, as he considers his dad to be scum. Run All Night is not simply an action film, as it's rather more thoughtful than that, but is instead deeper and a good watch.